If you’re a fan of photography, then the name Johnny Wu will certainly ring a bell. Operating on Instagram under the name sgtbananas, Wu became a sensation for creating riveting and cinematic still images using action figures instead of real people. And the results speak for themselves. 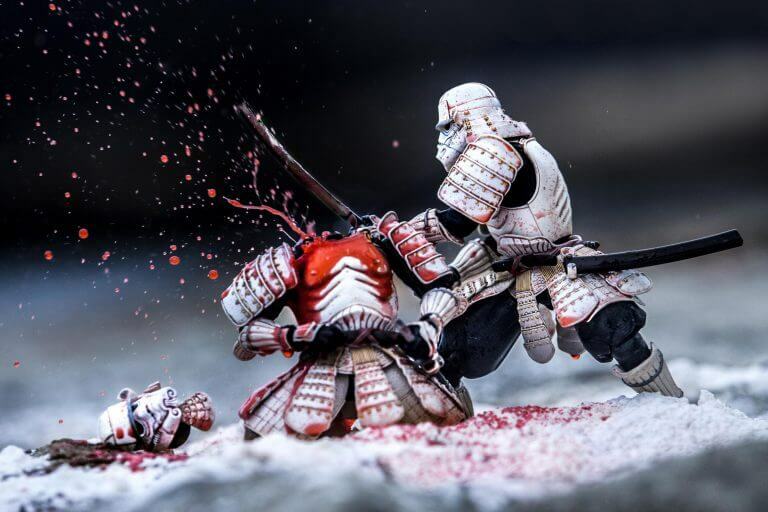 Where else are you going to see samurai Stormtrooper toys performing gore-soaked decapitations and dismemberments? In addition to using Star Wars figures, Wu’s images also feature everything from E.T. to 300, so there’s something for everyone I suppose. Early this year, Wu teamed-up with major comic publisher Dynamite Entertainment to release an art book collecting some of his greatest images. After being successfully funded on Kickstarter, the 224 page book, which will be called 10 Frames Per Second, An Articulated Adventure, is set to be released on December 19, 2017.
for £26.99 ($29.99 if you live in the US) to help support the work of such a talented artist. I swear, If you squint when looking at any one of his photos, it’s almost like you’re looking at a still from a movie.